Feeling a little lazy today, and since I posted two awesome posts in the past few days (which sadly did not go viral as I hoped it would, and the same can be said for most of my posts), I decided to share a press release instead. Gonna be doing things for future press releases as well, write an intro post to give my own few words before sharing the press release. Figured that it would be the best choice since I don't have any additional info I can add and paraphrasing the entire press release felt redundant. Anyway, one of the most popular MMORPG currently, Dragon Nest, is having a content upgrade in regards to its job system. The assassin class would be introduced, along with its job advancement, and a new raid map would be added in as well. Not sure how the assassin class would balance up the gameplay since Dragon Nest is a very party dependent game, so we'll have to wait on see on that. But it will definitely be fun though, because normally in MMORPGs, assassins are one of the more fun classes toplay. SINGAPORE — March 19, 2014 — The 7th and newest class for the Massively Multiplayer Online Role-Playing Game, Dragon Nest, has been released for South-East Asian servers. Cherry Credits is proud to announce that the Assassin will be made available on the SEA servers together with the Guardian Nest in Solo and Normal mode. The most notable change in this upcoming Dragon Nest patch will be the introduction of the Assassin to players. A class based on Strength and Agility, the Assassin conceals himself within the shadows to take his enemies’ lives unnoticed, using a scimitar or crook. 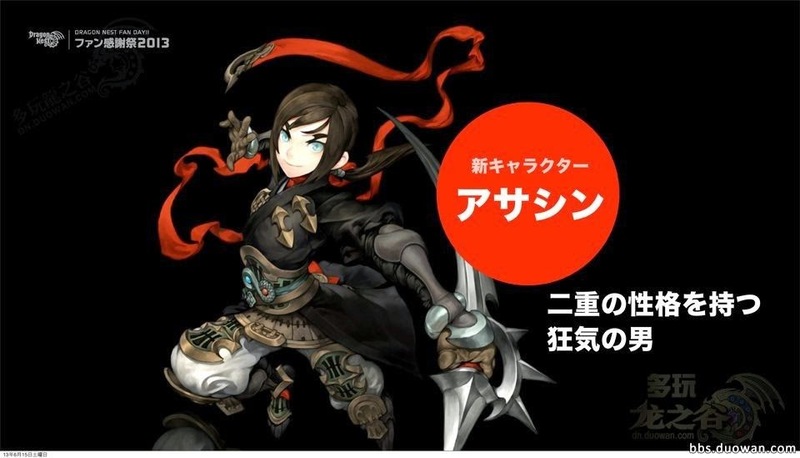 In Korea, the launch of the highly anticipated Assassin class has doubled the game’s active player base, due to the character class’s unique design. Each skill has been carefully planned and implemented, so players can explore a whole new battle experience with crisp clear skill graphics. Assassin’s arrival has also brought about a more elaborated storyline which lore-loving players can find out more about through the updated main quests. Along with the Assassin, the release also introduces the first upgrade path of the Assassin, the Chaser. Having inherited assassination techniques from ancient times, Chasers use concealed shadow weapons to pursue and silently take down enemies. Chasers can go through a second class upgrade to become either a Ripper who focuses on physical ninja skills, or a Raven that specializes in the use of hidden weapons to kill their enemies. The Assassins are also the first class to introduce two new mechanics to the game: a stealth mechanism which allows players to attack while they are hidden from sight, and also a charging mechanism that allows skill cool-downs to be prolonged to provide greater damage the next time it is used. The game update also introduces a new dungeon, the Guardian’s Nest. Protected by the Fell Guardian, Guardian of the Forest of New Moon, the nest is located at the 8-o’clock direction of the Garden of Time and Space, and is accessible to players of level 70 and above. Players who complete the Guardian’s Nest are expected to get rare materials to craft the epic “Full Moon/New Moon” weapon and armor set. Only the Normal and Solo modes of the Nest will be released for this patch.